Hawaii forms the lush backdrop for a veteran detective’s attempt to foil a grisly murder plot involving priceless looted artifacts. When Hawaii County Chief Detective Koa Kāne is airlifted to Pōhakuloa, an Army live-fire training area on The Big Island, he faces a mutilated murder victim and the most challenging case of his career as an investigator. The body, found inside a natural lava tube cave, bears the markings of a ritualistic sacrifice. The crime scene also surprisingly unearths a long-buried royal crypt within an ancient stonecutters’ quarry, which fits nicely into Kāne’s suspicions of a grave robbery or an illegal archaeological dig. The investigation ramps up when the son of retired-gumshoe-turned-fisherman Hook Hao is seriously hurt while exploring an unsecured military range on neighboring island Kahoolawe, south of Maui. Having developed personal discipline from years in the Army, Kāne is well-respected in the Hawaiian Island chain as a loyal, hardworking native, and he navigates the homicide with slick precision, undaunted by a string of messy leads and bumbling interlopers quick to jump on the scene. In between all of the diligent police spadework, McCaw, a veteran attorney, softens the protagonist’s hard-boiled exterior with a subplot involving his striking, younger girlfriend Nālani, who struggles with sexual harassment at her job in Mauna Kea. As the mystery deepens, the author masterly displays a finely balanced mixture of detective work, local color, and interpersonal melodrama. This winning combination is typically the mark of a seasoned writer, so this debut novel may exceed the expectations of many readers. McCaw keeps the sure-footed plotline suitably tight. As the narrative plumbs the history of Hawaiian archaeology and incorporates fascinating ancient island regal rituals, the area’s precious artifacts, and indigenous Polynesian customs, a complicated host of co-investigators and various suspects emerge. From a smarmy, ex-Marine archaeologist with good intentions to a secretive prince, a violent black market contraband dealer, and a star-struck astrologer, the suspects present Kāne with an arduous task. The pressure’s on the detective to sift through these individuals to find a common link, or discard them all to uncover the true villain before tragedy strikes again. 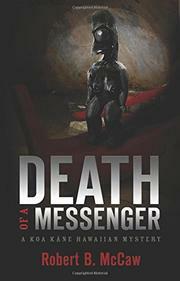 This book’s vivid, thrilling conclusion is both unique and atmospheric in a whodunit featuring a resilient sleuth successfully defending his native tropical paradise. A tautly paced, impressively accomplished police procedural marking the beginning of a promising mystery series.